The Northern Ireland Film School at South Eastern Regional College’s Ballynahinch Campus is now up and running. Given the recent success of local film makers it is surprising that there has not been a dedicated centre to learn the skills of the trade. But the gap has been filled. 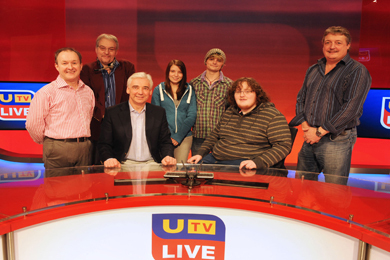 HND Creative Media ProductionÂ students from SERCâs NI Film School, Ballynahinch, Lara Star, Rhys Green and Nathan McKee enjoying the opportunity to put their presenting skills to the test at a special Presenting Workshop at UTV’s News Studios taught by long-established news anchor, Paul Clarke. Also pictured are William Scott UTV Director, Ralph Campbell Sound Engineer and Cameraman Paul Wilson. School leavers will now have access to unique higher education training and those already in the industry will have the chance to attend master classes delivered by experts. The NI Film School at SERC will focus on Broadcast Journalism and Professional Filmmaking and the first full-time course is well underway. The HNC in Creative Media Production is an innovative two year programme with an immersive learning approach. The HNC will involve producing news stories, documentaries and professional films first-hand. They will learn about sound design, camera techniques, interview and presentation techniques, research for media production and project management. It is a three-day a week course which will prepare participants for employment as well as provide a pathway into a degree. Nathan McKee, pictured sitting, was named ‘Most Promising Media Student’ on the day and recently attended a glamorous awards ceremony to collect his certificate of recognition. SERC provides a range of full and part-time courses designed to give students’ the edge’ through industry projects and a range of work placements to give them the skills needed to succeed in their chosen career. To find out how SERC can help you ‘get the edge’ call 0845 600 7555, visit www.serc.ac.uk or find us on Facebook, search: South Eastern Regional College.